There are over 40,000 existing school campuses in the United States, many of which are over 40 years old. Many of these schools require renovation or expansion to keep up with student populations or to bring them up to current building code standards. The 2015 International Building Code2 requires that ICC 500- compliant3 tornado safe rooms be constructed for all new E-occupancy facilities construction in areas of the United States which lie within the 250-mph wind speed zone (see FEMA P-361 4). This requirement has created a number of challenges for school districts and design professionals in states which have adopted IBC-2015. This article shows how one school district and its A/E firm economically solved this problem. The costs associated with new school construction seriously impact county and municipal budgets. This new requirement for adding tornado safe rooms in designs for new school construction has school planners scrambling to find economical solutions. School districts in rural areas where rapid expansion of the population is occurring are being particularly hard hit. Some school districts affected by the IBC-2015 requirement have opted to construct stand-alone tornado safe rooms. Others have decided to build new gymnasiums, classrooms, or cafeterias with dual use occupancy as tornado shelters. A space which is normally occupied for a school activity and has secondary use as a tornado safe room offers the greatest economy for sheltering students, staff, and faculty. However, construction of tornado shelters which have large volumes (high walls and/or large roof spans) is very expensive. A largely overlooked sheltering option is to retrofit existing interior school corridors with tornado safe rooms. In 2014, TLM Associates, Jackson, TN began collaborating with Remagen Corporation (Remagen Safe Rooms), Monteagle, TN to devise the most economical solutions for sheltering three middle schools in Henry County, TN. There are a number of reasons why the corridor retrofit options were selected. In addition to the speed of obtaining permits and construction which is associated with retrofitting existing buildings versus new construction, there were other reasons based on the economy of retrofitting these existing school corridors as tornado safe rooms while simultaneously upgrading the corridors for energy conservation to reduce operating costs and provide student protection against active shooters. This design strategy satisfied multiple requirements and led to the most economical solutions. Aside from the economy of utilizing existing corridors as safe rooms, a number of architectural considerations made retrofitting corridors with tornado safe rooms the best option. Historically, school corridors have been utilized as places of refuge for students during severe weather events. The closest protected space for students to occupy when severe weather threatens is an adjacent interior corridor. Moving students from classrooms into an adjacent corridor safe room keeps travel distances and student accounting time to a minimum. Two to three minutes is regarded as the maximum time permitted for evacuating frightened children from classrooms and marshalling them into a tornado shelter. Corridors are required to be free of furniture and other obstacles. This allowed all of the corridor space to be used for safe room occupancy. Corridor space is not a means of egress when it is acting as a tornado shelter except when students are exiting the tornado safe room after the storm has passed. Other spaces in schools having dual-use as tornado safe rooms have significantly reduced space for permitted shelter occupancy due to tables, chairs, bleachers, etc. ICC 500 requires two temporary sanitation facilities for the first 500 shelter occupants and one additional for more than 500. TLM’s solution was to store chemical toilets and soft enclosures in adjacent storage rooms and deploy them into the corridor safe room when the tornado alarm sounded. Corridor widths are typically much smaller than the roof spans across classrooms, gymnasiums, cafeterias, and locker rooms. 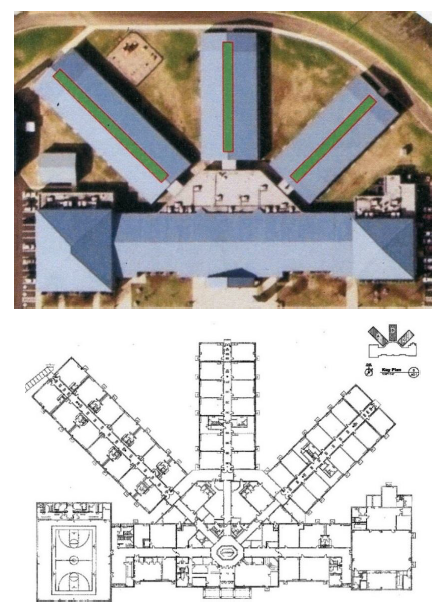 The uniform width of corridors facilitated design of linear tornado safe rooms having relatively short shelter roof spans. Short span roof panels, designed to resist the extreme tornado wind forces, were also designed for 200 pounds per square foot live load to account for the impacts of collapsing roof deck and roof framing of the host building. Corridor bump-outs for lockers and corridor intersections were easily accommodated. Existing walls, doors, and roof framing were not altered when erecting the safe rooms. 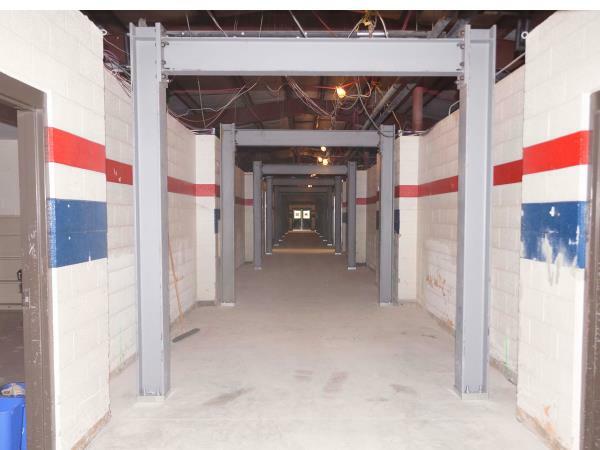 Rigid steel bents, which were designed to resist tornado wind forces transverse to the corridors and support light steel tubes to which modular cold-formed, light gauge steel wall and ceiling elements are attached, were anchored to new concrete grade beams or helical soil anchors. Converting existing corridors into dual use tornado safe rooms has several construction cost advantages. First, the safe room does not alter the existing school architecture. Tornado safe room doors are always held in an open position and are only closed when the corridor is used as a tornado shelter. Existing classroom, restroom, and other doors continue to be used at other times. Second, protection from normal exterior weather is provided by the host building envelope and does not need to be incorporated into the shelter design. Another important cost advantage of the corridor shelter involves construction of the shelter foundation. Since most existing school corridor walls are constructed with concrete masonry blocks, the walls are supported by continuous concrete spread footings. 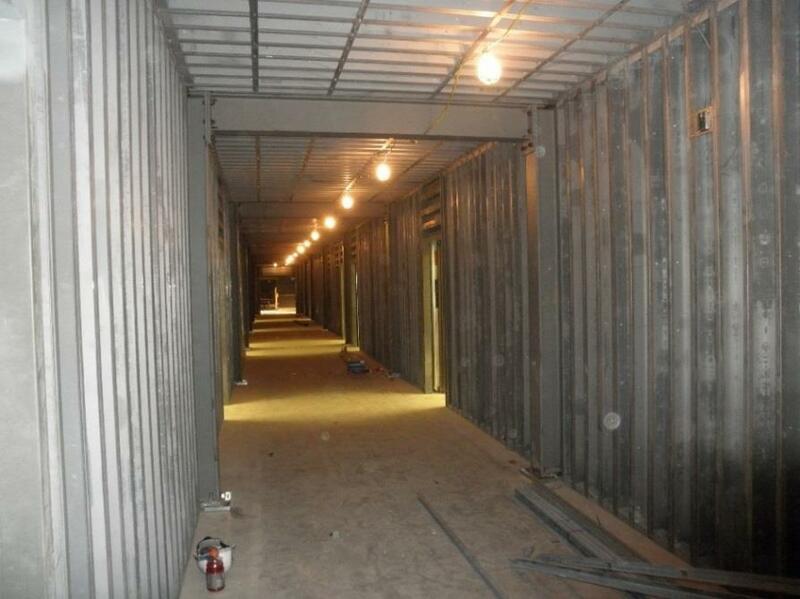 The corridor safe room design takes advantage of existing below-grade concrete foundations and supported masonry to provide significant resistance to uplift, overturning, and lateral movement of the safe room. New corridor floor slab and monolithic foundations also provide substantial structural stability for tornado wind forces on the relatively light safe room superstructure. On-campus pre-assembly of prefabricated safe room components was able to proceed outside of the Henry County school buildings beginning several weeks before the summer recess period began. When schools recessed, assembled safe room modules were easily transported to erection sites in the corridors without endangering workers or interfering with the flow of the erection process. Other interior school spaces were utilized to marshal materials prone to weather damage and to pre-assemble safe room components. Construction was never interrupted by rain or extreme weather. Construction logistics was simplified by progressive linear construction beginning at one end of each corridor and progressing to the opposite end. These benefits gave the contractor a huge advantage in completing projects on schedule. The finished corridor tornado safe room is an attractive and well-lit corridor and provides an inviting and familiar protected space for children adjacent to their classrooms when severe weather threatens. Travel distance from classrooms to the shelter is minimal. This reduces student anxiety and makes accounting of children by teachers much easier. The teacher controls the closing of the tornado door to his/her classroom so that no child is locked out of the tornado safe room by someone not familiar with the class. The average 2018 cost of new K-12 school construction in the 250-mph tornado-prone areas of the U. S. is $43,600 per student or $266 per square foot. 5 6 7 8 Construction costs for fortifying existing school spaces to qualify as tornado safe rooms should not exceed 150 percent of the cost of normal school construction (around $400 per square foot). The three schools in Henry County, TN were retrofitted with ICC 500-compliant tornado safe rooms sheltering about 2,300 persons at 2018 costs of $1,995 per occupant ($392 per square foot). Recent school construction reports indicate that the current construction costs per occupant of recently constructed school gymnasium tornado safe rooms ranged between $2,650 and $4,267, averaging $3,025 per occupant. 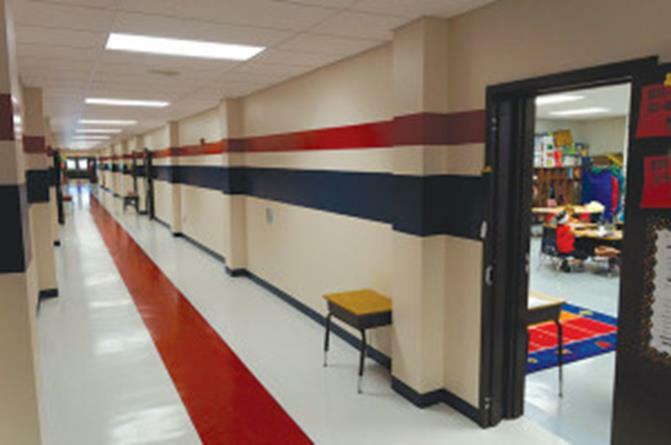 The cost advantage of retrofitting existing school corridors with tornado safe rooms is obvious. Retrofitting existing school corridors as tornado shelters is the most practical and economical solution for schools which already have gymnasiums. Recent tragic events have cause school administrators and planners to address the threat of active shooter attacks on student bodies. This requires thorough assessment of each school’s architecture, student environment, and operations to develop comprehensive measures and procedures to prevent an attack and to deal with an attack that occurs. America’s school campuses are increasingly under threat of violent attack. Many parents and children fear a repeat of the latest school shooter attack in their own school. A thorough vulnerability assessment must be undertaken to assess threats to students, including tornadoes, which are an annual, seasonal threat in many areas of the United States. Essential steps are listed below. Perform a comprehensive, professional school vulnerability assessment. Identify the school system’s critical infrastructure and key resources. Evaluate the threats to the school from an all-hazard perspective. Establish procedures for control of access and egress to buildings. Plan for monitoring of critical areas of the school by comprehensive video surveillance. Develop an interactive and cryptic staff and faculty communications system. Develop strategies to deter and defeat an active shooter or IED attack. Train school administrators, faculty and staff to respond to active threats in accordance with the EAP in a calm and orderly manner under the direct control of a trained school emergency response manager. In addition to planning steps such as those previously discussed, the use of tornado safe rooms to separate students from an attacker must be considered. A corridor school tornado safe room has several advantages for protecting students and faculty from attack. Robust, lockable corridor tornado safe room doors prevent an intruder/attacker from accessing the corridor safe room from the classrooms and unprotected corridors, and vice versa. Compartmentalization can be employed to prevent entry, entrap an attacker, or delay an attacker’s movement while countermeasures are executed by security and law enforcement officials. Multiple evacuation routes from a corridor tornado safe room to the exterior of the building are provided by the large number of safe room classroom doors. Where an attacker is inside a corridor safe room, the EAP may include active measures to blackout the corridor safe room, activate horns, sirens, fire alarms, fire sprinkler system, and/or activate strobe lights to confuse or debilitate the attacker, or facilitate security or law enforcement employment of active measures to kill, capture, choke, blind, or otherwise incapacitate the attacker. Robust tornado safe room doors and walls provide protection against gun fire and IED blasts and fragmentation. Corridor safe rooms do not have windows. Steel doors and walls of the corridor safe rooms are capable of resisting ballistics penetration of standard ammunition of most hand guns and IED fragments at nominal standoff distances. International Building Code, 2015 Edition, Third printing, International Codes Council. ICC 500-2014, ICC/NSSA Standard for the Design and Construction of Storm Shelters, International Codes Council.